With the large selection of fresh vegetables available in the market, a Grilled Vegetable Salad is best summer side dish. You just have to grill the variety of vegetable through a special technique and toss them toss with the rich vinegar-garlic dressing. However, you can coat the toasted vegetables with Orange Vinaigrette Dressing or the Vinaigrette Salad Dressing Recipe etc. This nutritious and refreshing summer vegetable salad less than 20 minutes to make and be stored in refrigerator for one to two days. First of all pre-heat you grill to medium heat. Take a large bowl and place the trimmed and bite-sized asparagus, cherry tomatoes, rings of red onion, yellow bell pepper, and the red bell pepper. Pour in extra-virgin olive oil and season with ground salt and pepper to taste. Toss the vegetable slices until coated well and the salted dissolves completely. Now, place the coated vegetable slices in the pre-heat grill and roast them for 5 to 7 minutes or until well-cooked and soft, turning occasionally. 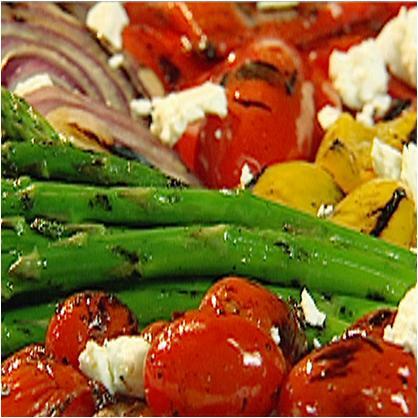 Remove the grilled vegetables and place them on a large serving platter. Sprinkle the vegetable slices with feta cheese and some fresh basil leaves. Pick a small bowl and add in finely chopped clove garlic. Top the garlic with balsamic vinegar and the extra-virgin olive oil. Sprinkle in some salt and pepper to taste. Mix the ingredients until the salt dissolves and smooth. Drizzle the dressing over the grilled vegetable slices and toss gently to mix them. Grilled Vegetable Salad is all set, serve and enjoy!